A New York Times article over the weekend delves into the history and rationale of the 2 percent inflation target, beloved of central bankers everywhere and a fairly recent innovation. Of course, the US Federal Reserve has a dual mandate, which includes both inflation and employment goals. The Fed said last week that it was most likely to start raising interest rates around the summer of 2015, but many countries’ central banks are moving in the opposite direction, solely because inflation is falling short of their targets. Private borrowers—who usually have higher propensities to spend than lenders—benefit from an easing of the burden of debt when wages and prices move broadly upward. Also, for governments with debts that they cannot service with their own currency, inflation eases the burden of making payments, as tax revenues tend to rise in step with nominal wages and prices. Of course, falling prices have the opposite effect. The resulting changes in spending reverberate through the rest of the economy. Recent data show that there exists a strong threat of deflation around the world in economies such as Japan and the Eurozone, where core inflation has recently turned negative. The effect of deflation on spending by indebted households was noted by Keynes in Chapter 19 of the General Theory (pp. 268-269). Michal Kalecki also argued to this effect in a critique of the so-called Pigou effect (falling prices would supposedly restore full employment by raising the inflation-adjusted wealth of households). The New York Times emphasizes instead the point that lower inflation makes it easier for some inflation-adjusted wages to fall, given that wages do not move downward as easily as upward. It also mentions that modest inflation permits central banks to lower real short-term interest rates below zero. Thoughts that deflation might be coming in much of the world are very sobering. I highly recommend a movie to be released next year (that is, the year that begins next week). Terry Jones, of Monty Python fame, is one of the key developers of the film. It is on the Global Financial Crisis, but also provides a quick history of bubbles and crashes. It is highly entertaining and as good as any that I’ve seen on the crisis. The movie features Hyman P. Minsky as well as J. K. Galbraith, who appear as life-sized puppets. One of Terry’s crew told me they brought Minsky over from England on a plane as a fare-paying customer. I would have loved to have seen the look on the faces of the flight attendants. I hope they bought him a beer. Originally they were to film Minsky in his office at the Levy Institute, but when they saw pictures of it they said that there’s no way such a big and important economist could have had such an inauspicious office (albeit in beautiful Blithewood overlooking the Hudson). So they used a nice library down in Manhattan. In revealing the truth about our unstable economic system, the film acts as the starting point for global project BoomBustClick.com – to get the world talking about change through education. A central hub for information, news and ideas, BoomBustClick is an online resource for everyone – can we change an unstable economic system? Can we adapt economics to human nature? Terry interviewed me for the film. He’s as funny as you’d expect, but also deeply engaged and knowledgeable. Most of my interview ended up on the cutting room floor, but some bits survived. Go to the project’s website for more info; I presume they’ll be posting up the film’s release date soon. There are some clips on the making of the film that you can enjoy now. “This collection brings together distinguished scholars who have been influenced by Jan Kregel‘s prodigious contributions to the fields of economic theory and policy. 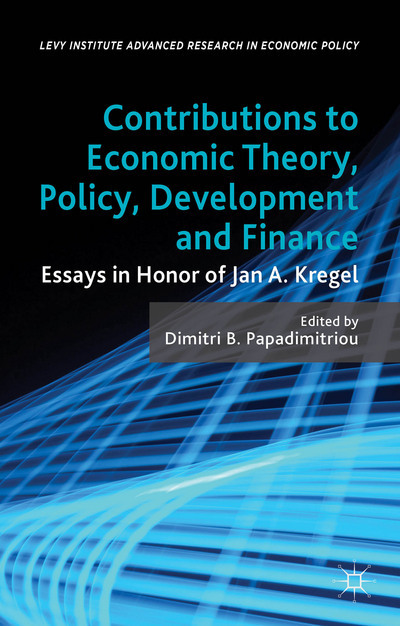 The chapters cover and extend many topics analyzed in Kregel’s published work, including monetary economic theory and policy; aspects of the Cambridge (UK and US) controversies; Sraffa’s critique on neoclassical value and distribution theory; Post-Keynesianism; employment policy; obstacles in financing development; trade and development theories; causes and lessons from the financial crises in East Asia, Latin America, and Europe; Minskyan-Kregel theories of financial instability; and global governance. Combining rigorous scholarly assessment of the issues, the contributors seek to offer solutions to the debates on economic theory and the problem of continuing high unemployment, to identify the factors that determine economic expansion, and to analyze the impact of financial crises on systemic stability, markets, institutions, and international regulations on domestic and global economic performance. You can download a sample chapter (pdf) from Palgrave. • scholars from the Levy Institute, including its president (Dimitri B. Papadimitriou), who heads the Institute’s macro-modeling team projects. Adding to this rather illustrious list of speakers were panel moderators from The New York Times, Wall Street Journal, Bloomberg News, National Public Radio (USA), and various daily newspapers in Greece. To join a webinar, simply click here at the time listed above. Regular Decision deadline: January 15. Scholarships available. Dean Baker, everyone’s favorite progressive economist (mine, too), has an interesting take on our unemployment problem: Give more paid vacations. The idea is that if all the employed work less, employers will need to hire the unemployed to produce what the already employed won’t be producing while sunning themselves on Florida’s beaches. Look, I’m all for shorter workweeks. It is ridiculous that labor’s push somehow got stuck a century ago at the 40-hour workweek in the USA. 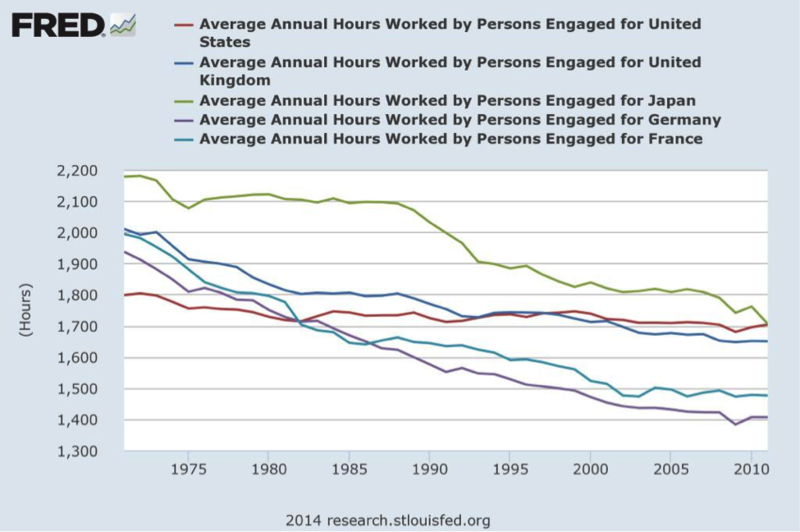 Employed Americans work more hours per year than just about any other workforce on the planet. But, as Joan Robinson once declared, the only thing worse than working as a wage slave is to be unemployed. Just ask the Italians, who now have the highest unemployment rate since they started keeping records. Thanks to the EMU and German fiscal rectitude! I see shorter work days and more paid vacations as a progressive goal to humanize the work place. More time to enjoy one’s family, recreation, and the arts. More time for self-improvement and community involvement. More time for our wage slaves to enjoy the life of leisure long pursued by the leisure classes.